Temporary measure to provide extra protection for Dutch Jewry follows recommendation from counter-terrorism agencies. Amsterdam is to beef up security around Jewish synagogues and schools following last month's shooting at the Brussels Jewish Museum which left three people dead, its mayor announced on Friday. "We are looking at the shooting's consequences for Amsterdam's Jewish community," Eberhard van der Laan said in a letter sent to the Dutch capital's city council. "We are taking measures," the mayor said, adding exact details still had to be finalized with the Jewish community, police, the Safety and Justice Ministry and the Dutch counter-terrorism agency, the NCTV. The decision however comes on a recommendation by the NCTV on Thursday that temporary measures be taken, following the May 24 attack by a suspected French Islamist terrorist in neighboring Belgium. Mehdi Nemmouche, 29, was arrested on suspicion of the triple murder, killing an Israeli couple and a French volunteer and leaving another museum employee in a critical condition from which he has no prospect of recovery. Esther Voet, the director of the Hague-based Centre for Information and Documentation on Israel (CIDI) told AFP plans were to beef up security at schools and Amsterdam's 10 synagogues. "We have also taken our own security measures which are already in place," she added. There are around 52,000 Jews living in the Netherlands, according to the CIDI - almost half of them in Amsterdam. One of the most famous landmarks in the city is the Anne Frank House, which documents the young Jewish girl's experiences as she and her family hid from Nazi persecution during World War II. The Frank family was eventually caught and sent to Nazi concentration camps including Bergen-Belsen where Anne, age 15, and her sister died of typhus in 1945. Anne's diary was rescued by a family friend, and through the help of Anne's father Otto Frank was published and eventually translated into more than 60 languages, including in English as The Diary of a Young Girl. When contacted, the Anne Frank House declined to comment whether security had been stepped up. Van der Laan said the NCTV indicated there was "no concrete information that an attack was indeed being planned on Jewish institutions in the Netherlands." "It is however conceivable. Therefore, we'll take the necessary measures to increase security," he said. 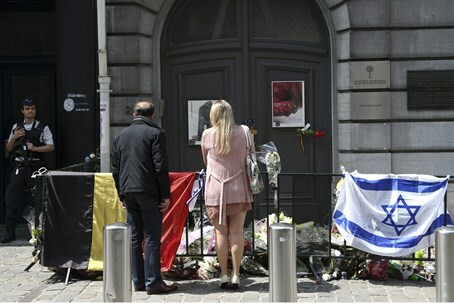 World Jewish leaders have repeatedly called on the EU to take steps to prevent more attacks like the Brussels shooting, or even place permanent security details around European Jewish communities.